The design of this hotel emphasizes the impressive harbor views at every instance. Incorporating unique artwork and sculptural pieces, the space creates an ambience of high culture and luxury. The rich warmth of timber-paneled corridors opens out into two different typical guest room schemes furnished in soothing palettes of wild plum and ivory. Upon entering the hotel, the eye is pulled towards the far, light-suffused end of the atrium, with its generously framed view of Victoria Harbor. Welcoming seating groups and the spiraling curve of the grand staircase draw the eye upward to the higher levels of the atrium. The space progressively decompresses as the atrium’s height is revealed. The warmer ambience of the timber-paneled areas serves to pull the guest into the concierge and reception areas on the left of the main entrance. The lobby lounge opens in a series of dramatic waves, curving upward along the ceiling. 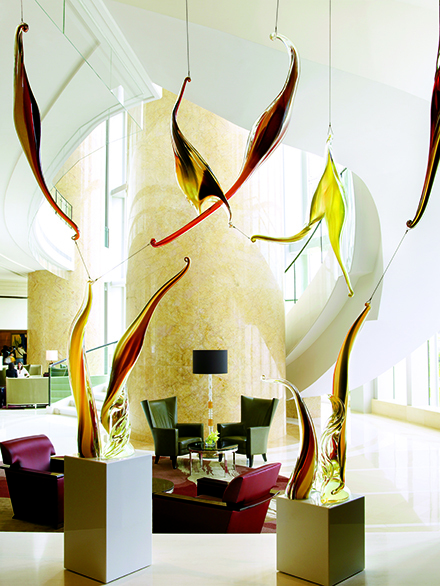 The space is accented by a large original glass sculpture—one of the many unique commissioned art pieces in the Four Seasons Hotel’s collection. Emphasized by contrasting timber paneling that continues from the adjacent reception area, these curving planes feature luminescent metallic rays disappearing to a single vanishing point at the far end of the lounge. Rising above the conversation is the “Allium”, a sculpture by English artist Ruth Moilliet. A silvery ceiling of small, square recesses complements dark, glossy timber walls with dramatic glass inserts. The focal element is an internally lit cast glass column of watercolor shades, reflecting the harbor waters, that invites like a beacon through the exterior glazing. This ballroom is characterized by a floral intertwining motif that runs across the carpeting and is amplified by over-scaled floral relief panels that wrap around the upper levels of the space. Light-filled harbor views pour in through full-height windows, and carved out of the facing wall are alternately two-toned timber paneling niches for a series of double entrance doors and narrow mirrored niches housing carved stone sculptures. On the ceiling, backlit glass panels are defined by bronze framing, creating a visual rhythm that is interposed by elegant blown glass and bronze chandeliers. There are a total of seven meeting rooms, each featuring a unique material scheme to give each room its own distinct identity. Unified by the same detailing of timber-paneled walls, decorative lighting and champagne-finished ceiling coffers, these schemes are expressed through the creative mixing of different exotic timber veneers, carpet designs and soft furnishing colors. Selected, large art pieces are displayed in fabric-paneled recesses and further underscore each room’s theme. Commanding the highest level of the hotel, the Executive Club Lounge and Cigar Bar occupy the entire 42nd floor. The lounge is given the visual illusion of width by using light-colored finishes along the window wall and creating a predominantly dark plane along the opposing wall. This dark plane is then articulated in a tactile language of contrasting areas of dark timber, striated glass and carved out recesses for sculpture, a TV lounge and a seating banquette. A moody decadence pervades, made rich by dark, stitched leather and timber walls, textured fabrics and ceiling coffers of bronzed glass. At the focal center sits the bar, a theatrical statement in backlit, richly hued art glass. Like cradling ice in brandy, the glass-backed wine display provides a sharp, visual counterpoint within the surrounding moodiness. The double-storied health spa features extensive facilities such as wet treatment areas that are exemplified by two huge vitality pools, as well as intimate treatment rooms. Seven bays in length, the presidential suite speaks an animated language of classical detailing expressed in white timber and marble, which further amplifies the space and feels simultaneously intimate.